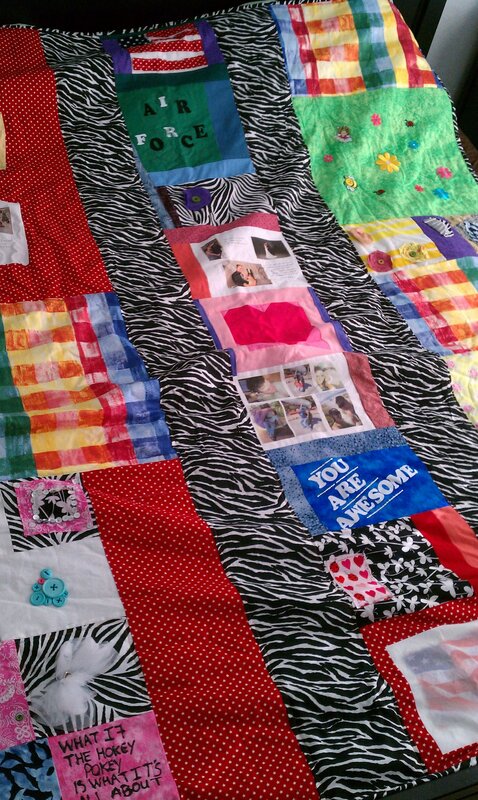 The quilt stitched for MacDill ESC member Lindsey Paxton. During my membership of the MacDill Enlisted Spouses Club, one of our young members, Lindsey Paxton, was diagnosed with brain cancer. We all felt we needed to do something, to let her know how affected we were and just how much we cared. We all gathered together (some of us crafty and some of us not so much) and began the task of making her a quilt. We accomplished that, with the help of many (including Bobbie O’Brien) and got it shipped out to her. 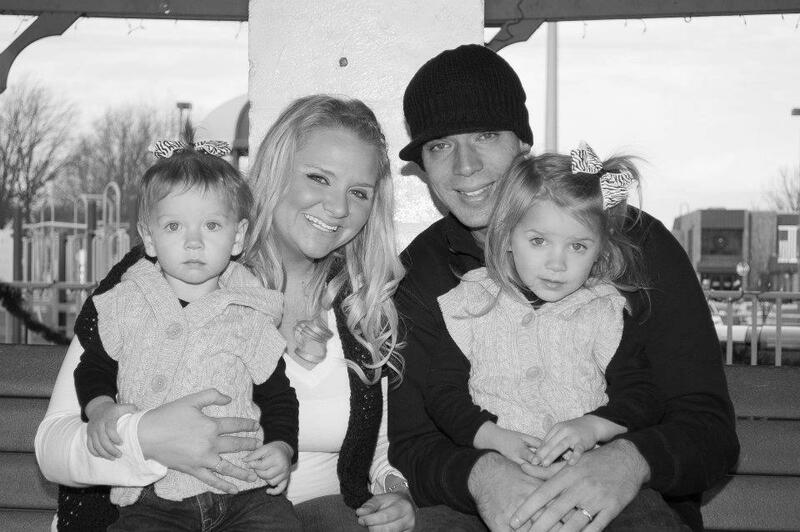 Lindsey was a young military wife, newly married to her husband Chance. She had her entire life ahead of her, and was stricken with such an awful disease. You would never know it. She remained upbeat and very inspirational. Lindsey lost her battle to cancer this past Sunday, all the members that she touched were deeply hurt. She left behind her testimony on YouTube, and with that I firmly believe her legacy. I will always remember her smile, and how a group of women gathered together in hopes of making something that would provide comfort during a long and strenuous battle. 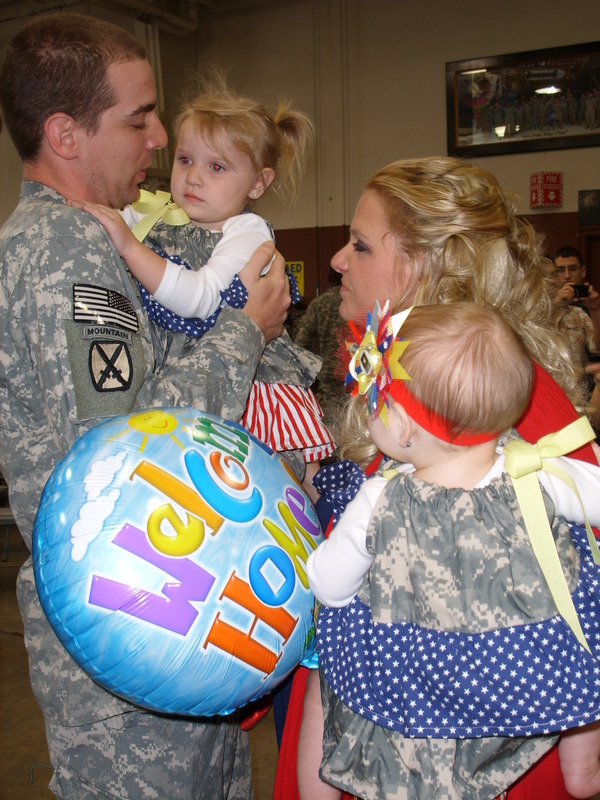 The Dorr family when Jackie's husband returned from his fourth deployment in their five years of marriage. Today is September 11, 2011. Ten years ago I was standing in my dorm room at the University of Florida, getting ready for my first class of the day, with the Today Show on in the background. I watched in disbelief as the first plane flew into the first tower. Like many Americans my first reaction was to pick up the phone and call someone, I called my mom. She was equally as shocked. Then there it was, a second plane. It’s a day my children will learn about in history class years from now, much like Pearl Harbor Day, yet they will never grasp the immense devastation this nation felt. My father was still active duty at the time, and my family lived on Keesler AFB, a mere six hour drive from UF. My brother was still in high school, and he described that September day to me once I came back for a visit. School buses were stopped at the gates in backed up traffic, students were being checked for ID cards. Armed airmen patrolled the neighborhood by foot, etc. Knowing that war was inevitable, I had made a decision that I wouldn’t ever marry anyone in the military. The future was uncertain, but one thing I think most people knew was that this wouldn’t be a quick fight, it would last a while. My husband enlisted into the delayed entry program in 2002, a few years before we met. 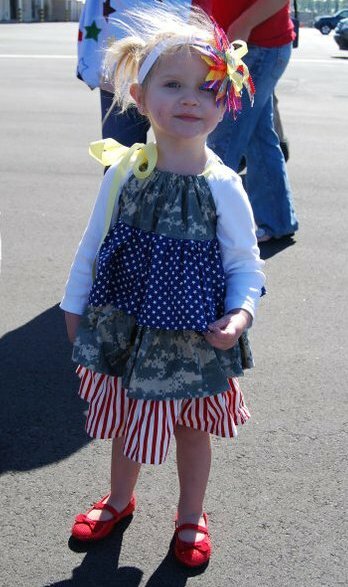 So here I am in a life I swore I wouldn’t live, raising children with a soldier, realizing that it is mission first. Being around the military changes your perspective on things, and last night couldn’t make that more clear. Last night was date night, so Brian took me to the movies. I got dressed up, as did he and we made our way to the now outrageously overpriced movie theater. We had already decided weeks ago that we wanted to see “warrior”. The main character is a Marine, and we find out later in the movie he deserted his unit in Iraq after being the only survivor of a friendly fire attack. The actual movie was naturally more drawn out and much more dramatic than that tiny snippet but that part resonated in my head. When you hear deserter you get mad, one thinks of a coward, traitor…. Right? 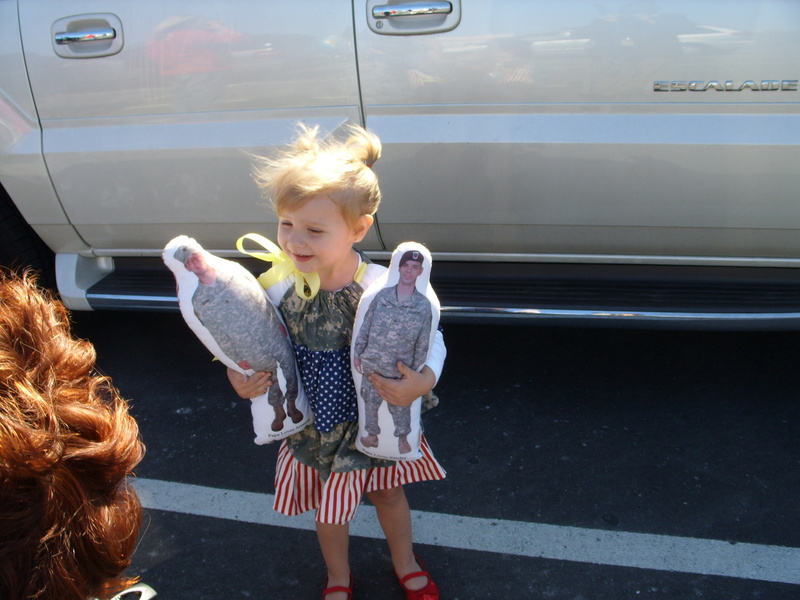 Paisley Dorr holding her and her sister's Daddy Dolls as she waits for her Daddy to come home March 2011. I felt for him, on the drive home Brian and I discussed it, we understood it, did we think it was okay? No, of course not, but we got it. It reminded me on some level of a time when Brian was heading back after his R & R and there was a soldier who was catching a flight, but was meant to catch one on the previous day. I struck up conversation with him, while we stood in line at security. His family clung to him, much like I was clinging to Brian. I asked why he had missed his flight the day before, and he began to tell me how it was intentional. He had contemplated deserting, never returning, it was his fourth deployment and he was tired. His sense kicked in, realizing the punishment wouldn’t get him what he wanted either, which was to be with his family, watch his children grow, be with his wife day in and day out. I find myself wondering what happened to him, and remember the feeling of shock at the time as I heard his story, but now….. I get it. Anastin Dorr showing off one of Mom's hair ribbons. I spent a good few hours this morning making ribbon and fabric rosettes for a headband for a dear friend of mines soon to be born daughter. I logged into Facebook to post the pictures for her, so I could pack them up for their long journey to Europe. 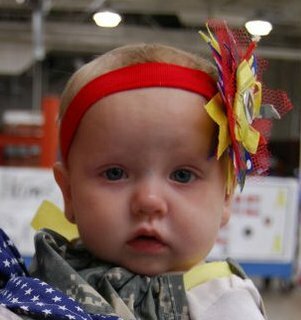 Paisley Dorr wears a patriotic hair rosette for her father's homecoming in March. My heart almost stopped beating, my eyes filled with tears. What a brief note yet so touching. While it does in fact give you a new perspective, it gives you insight into the daily life of military families and members. It got me to thinking of the many families who sent a loved one to war, not knowing what situation would return. 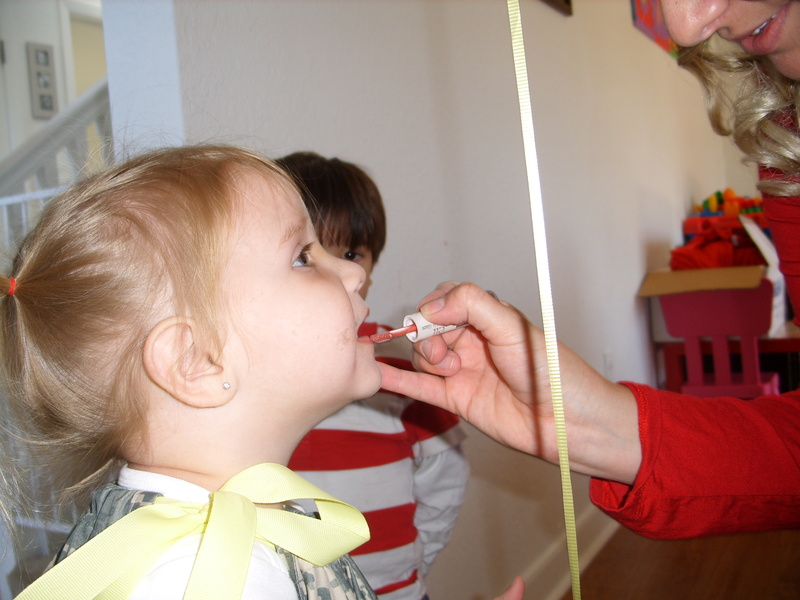 When I lived in Texas, the clinic I was assigned to was BAMC (Brooke Army Medical Center). BAMC is home to the burn unit, and is a stop that many wounded warriors make on their long road to recovery. I remember being sick with a cold wishing I would just die, as to not feel the misery that was the virus infecting my body, and it never failed I would have a wake up call much like my dear friends. I would round a corner and see a young soldier (no more than 19 years of age) missing a leg and burned very badly. They never looked sad, more often than not they were joking with the hospital staff, that no doubt they know very well by the end of their stay. I always took it as God giving me a sign showing me to be appreciative, and that while even if it feels like the cards are stacked against you, you can always see the beauty in life. Thank you dear friend, thank you for sprucing up my perspective. 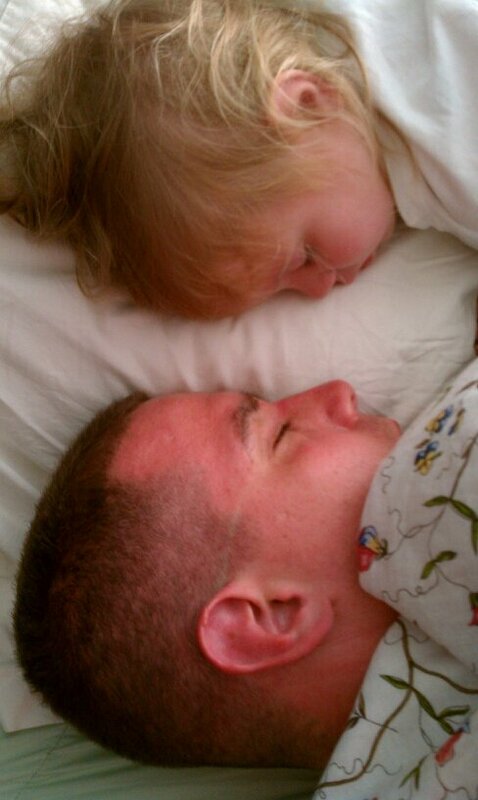 Exhausted after a day at play, Brian and his daughter Paisley. 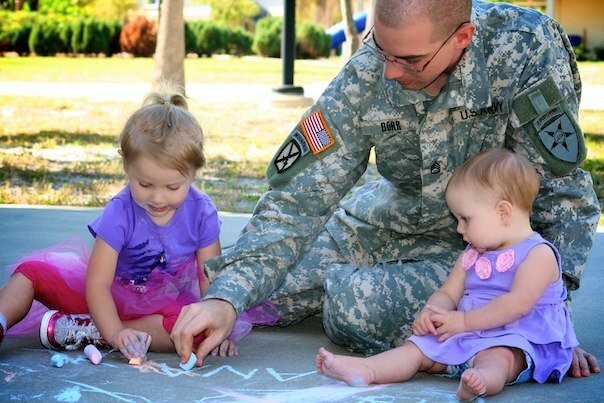 I think my greatest fear about my husband’s redeployment earlier this year was how our young children would adjust to their father being in the home. They knew their Daddy, naturally, however they weren’t quite used to him being in our home. Memories of his previous redeployment flashed in my head like a horrible nightmare I couldn’t wake from. Paisley, our oldest princess, wanted nothing to do with Brian. That is putting it nicely, it wasn’t as though she just ignored him and gave him the silent treatment, it was more like she screamed at the sight of him. We had to bribe her with Goldfish crackers to go near him, and I couldn’t leave the room. Needless to say, this caused stress and anxiety for all of us. 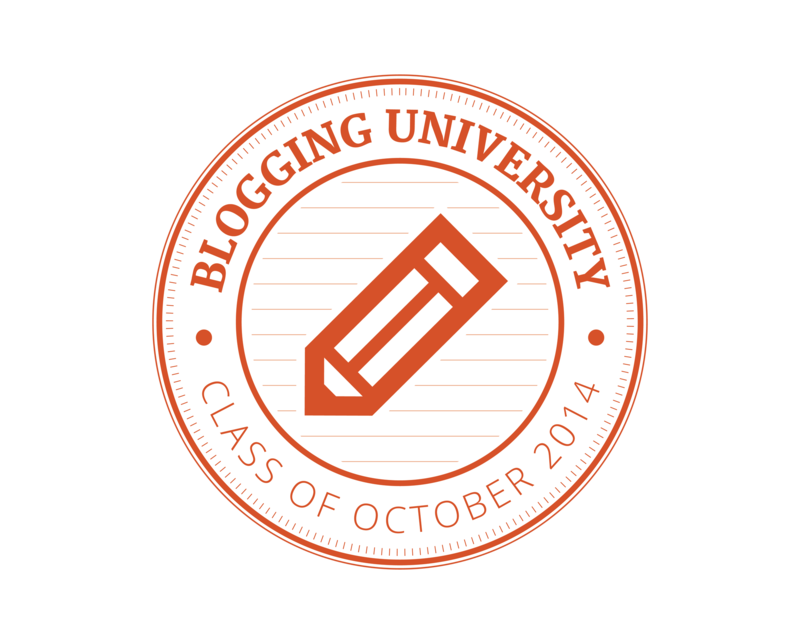 With these less than sugarplum like visions dancing in my head, I braced myself for redeployment. I was so excited to have my husband coming home, yet so scared. Paisley, left, and Anastin, right, draw with chalk on the driveway with Dad. Anastin, our youngest princess, took some time, but warmed up nicely. Both girls love their father tremendously and show it in so many ways. Ana reaches out for Brian every time she sees him, “HA DA DA”, cuddling up on his chest and giving kisses. Paisley always wants to be with her Daddy and does everything with him. I smile while doing the dishes, looking out watching Paisley and Brian walking our dog Holly. 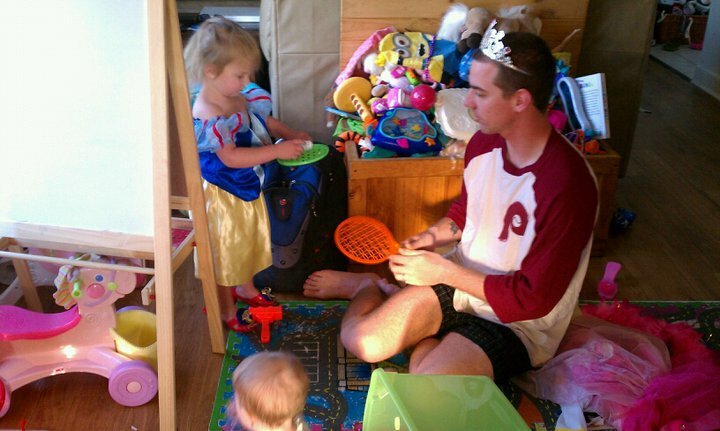 It makes me giggle to see Brian dress up in the finest of tiaras and have tea with our princesses. He takes every chance he can to soak in the time with his children, because inevitably he will deploy. 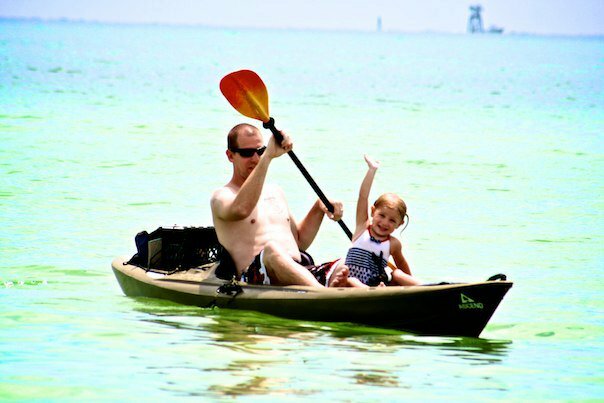 Dad takes his daughter, Paisley, for a kayak ride. While deployments never seem to get easier for the aching heart, this last redeployment was such an improvement that it gives me hope for a close family again. For a while, I feared we would always have this rift caused by constant separation, constant training, constant deployments. I have hope that my daughters will forge strong bonds with their father, and will have close relationships through it all. I know that as long as Brian is a soldier, life will not be the cookie cutter model that the Cleavers taught us it could be, but rather we will make our own. It was a normal Sunday night in the Dorr household, the children were asleep, and after having spent quality time together, I headed to watch television in bed whilst Brian turned on his Xbox. I wasn’t watching for more than a few minutes when the announcement that President Obama was going to speak, unexpectedly, came through. Earlier in the day, MacDill Air Force Base had gone to DEFCON BRAVO, and we were all wondering why. That question was answered with the exciting news that Osama Bin Laden was killed. Facebook erupted with statuses of elation, and I ran out to the living room to tell Brian (playing Xbox Live with his twin Richie). Brian was ecstatic, after 10 years that terrorist was finally captured, and killed. Brian and his brother enlisted after 9/11, because of 9/11 like so many other service members. Is it wrong to be happy someone is dead? I find this case to be an exception, this is a man who has to blood of thousands of Americans on his hands, I think it is okay this time. Will this war be over? No, of course not, after all he was not the only terrorist out there, new leaders have emerged, and followers still fight (fighting dirty I might add). 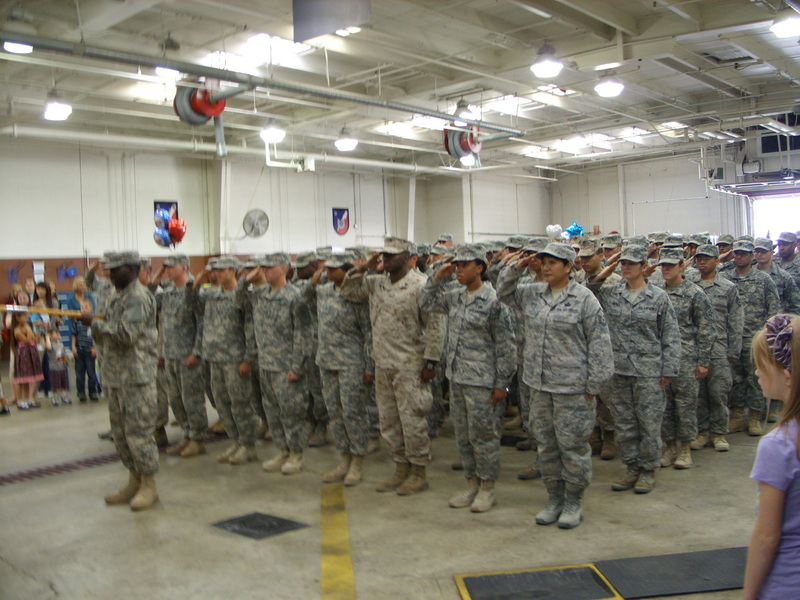 I pray that our deployed troops face no retaliation. Keeping this as honest as I can, I will say I was annoyed at the posts indicating “Obama did what G.W. couldn’t!” Very untrue, without Bush having set all of this in motion, it would never have happened, and last time I checked Obama isn’t out there doing the gritty footwork that is our intel and military. Seems like the most erroneous statement, however, I look past it. Other Facebook status’ claimed that the military deserve a raise, (this coming off the coattails of the recent government shutdown fear) . My comment on this is, it is sad that any military member could possibly qualify for WIC (federal food subsidies for low income pregnant Women, Infants and Children). 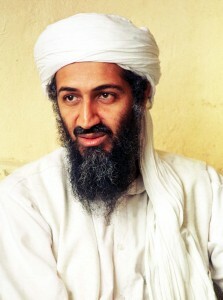 All “soap-boxing” aside, it’s true, Bin Laden exists no longer. Justice has been served. I think this has thrown lighter fluid on embers that were our nation and sparked a patriotic fire, it was what Americans needed to hear. God Bless America! 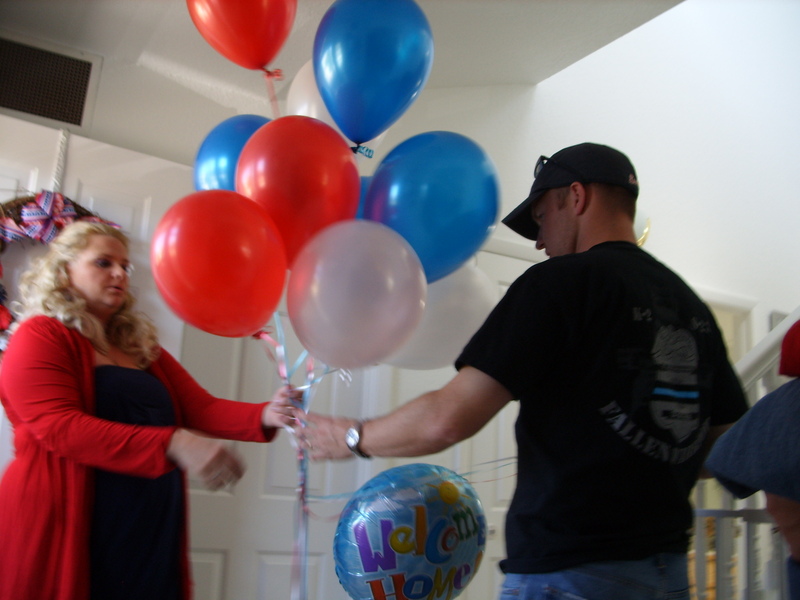 Friends help Jackie Dorr decorate the house for her husband's homecoming from his fouth deployment in their five years together. I woke up thinking – it was finally happening. It was the day I get my family back! My house buzzed with activity – all my friends and their children – as we did last minute cleaning preparing for my husband’s return. Then came word, his last connection from Bangor, Maine was delayed. For a moment, it felt like it wasn’t going to happen. As I did my hair and makeup, I couldn’t help but feel like it was my wedding day, and I was readying to see my groom. We dressed the girls in their custom made dresses and their ruby red slippers, as Paisley calls them her “special come home Daddy shoes” and loaded up the car. Paisley wanted to wear lipstick too for her Daddy's homecoming. While everyone walked downstairs, I collected myself, and laid out the gifts I had gotten him to make up for missing Christmas, our anniversary and Valentines Day. The whole drive to the compound, Krista calmed my nerves letting me know how amazingly happy she was for our family. When we got to the compound, the bay was not quite ready but that didn’t matter, we would wait for hours if need be. Paisley kicked off her shoes and ran around the CSD Bay, getting her little feet so dirty, but it didn’t matter she was excited and this made me happy. 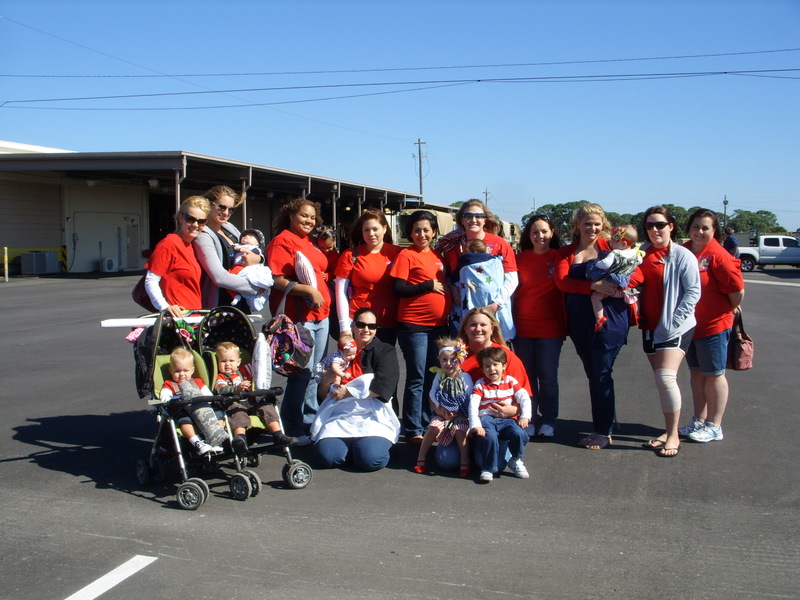 Members of the MacDill Enlisted Spouses Club are known for their bright red shirts and for showing up for every homecoming not matter the time or number of returning troops. Then 1600 came, and my phone rang. He had landed and they were getting on the buses heading to the compound. It seemed unreal! “A bus just pulled up” Krista tells me. The Joint Communications Support Element, based at MacDill AFB. The troops line up in formation, and we listen to first the 1Sgt and then Lt Col Burnham as they speak about their performance during this deployment, all the while Paisley stood confused. She kept saying “Mama I want my Daddy”. Then the words we waited for, he was released. I took off running towards where Brian was standing. He wasn’t there. I turned and saw he ran around everyone the other direction towards us. Paisley jumped into his arms “DADDY!! !” Tears flowed down my cheeks as I watched my husband hold our oldest “princess. ” He kissed her and told her how much he missed her. It didn't take long for Anastin, 8 months, to fall asleep in her Daddy's arms. This was a stark difference to his last homecoming. Last time, she was terrified of him, this time she was so excited. I was holding Anastin, and she was looking at Brian and Paisley, no doubt trying to figure it all out. She turned 8 months this day, and for 7 months of her life her father has been gone. I ask him if he wants to hold her, and warn him that she might cry as she has horrible separation anxiety. He answers yes, and we swap children. Anastin whimpered slightly but then was quiet. He kissed her and she took it all in. Before we knew it, she had fallen asleep in her fathers arms. Life is good, this is how it should be, a father holding his children. Paisley has been attached to Brian’s hip since. He has been home, playing dress up and reading books. She loves her Daddy and is enjoying having him home. 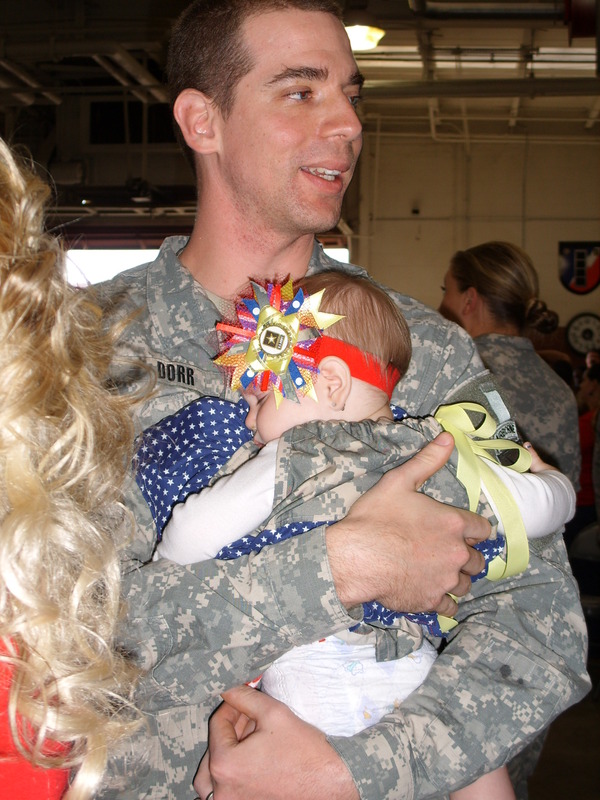 SSG Brian Dorr plays with Paisley, his 2-year-old daughter, after returning from a seven-month deployment. He has already returned to work, and at first she was upset by this, but he comes home for lunch and is home at night, which eases her concern. We are taking life one step at a time, reintegration is never easy, and always comes with unique challenges. A two year old can be overwhelming alone, but topped with an 8 month old with separation anxiety. We take each day as it comes, and are all soaking in every second of having our family complete again.